Lance Kilkenny's gun is believed to be the fastest in the West, but once the gunfight is over, he disappears. Most folks don't even know what he looks like. Some time back, Mort Davis saved Kilkenny's life after he was shot up. Now Davis needs Kilkenny's help. He has filed a claim on a water hole near Lost Creek in the live oak country. The district is dominated by two wealthy cattlemen, Webb Steele and Chet Lord, each one desiring for himself the water hole that Davis claims. Beautiful Nita Riordan owns the local saloon, and between her charms and the feuding ranchers, Lance Kilkenny has his work cut out for him. ©1947 Better Publications, Inc. (P)2006 Blackstone Audio Inc.
Would you listen to The Rider of Lost Creek again? Why? Probably not. There are so many characters among the fighting factions it gets confusing. There is Lord and his men, Steel and his men, Kilkenny's friend Mort Davis and his men. There's the unknown leader and his men of Apple Canyon, some gunfighters known to Kilkeny. Then there's bartenders called by name and town-folks, as well as Rusty Gates who takes Kilkenny's side. It takes rapt attention to sort them all out; to know who is being spoken to, about, and to whom. What was one of the most memorable moments of The Rider of Lost Creek? The revealing of the identity of the murderer near the end of the book. Which character – as performed by Jim Gough – was your favorite? I was very very upset with this book. It was to be a unabridged version of the book. I could not believe what I was hearing. Loius L'Amour in my a opinion is one of the greatest writers there is. Jim Gough also did a good job of reading the story. But Audible needs to change this for a UNABRIDGED version to a ABRIDGED version. The narrator was just poor. Good voice, but the pronunciation of sentences was awful. He totally emphases the wrong words! Very annoying and sometimes bad enough to where you can&#8217;t understand what&#8217;s going on. Okay overall. Worth it if you have a few credits lying around, but there are better narrators and better Louis L&#8217;Amour stories out there. Performance was lousey. Tried too hard to sound "western". Tried too hard to sound "tough". Not believable. The sequel to this book (The Mountain Valley War) is much much better than this one. This book has a different narrator than most lamour books, I liked it but I can see how some wouldn't. Not a great book, but a good start and transition into the next book which is a favorite of mine. I have always loved Louis Lamour! This book is one of the best and the reader and performance was outstanding! I was very disappointed. The narrator ruined what could have been a very good listen. Flowed well; developed keeping attention every moment. Only criticism, I wasn't fond of the main characters name. 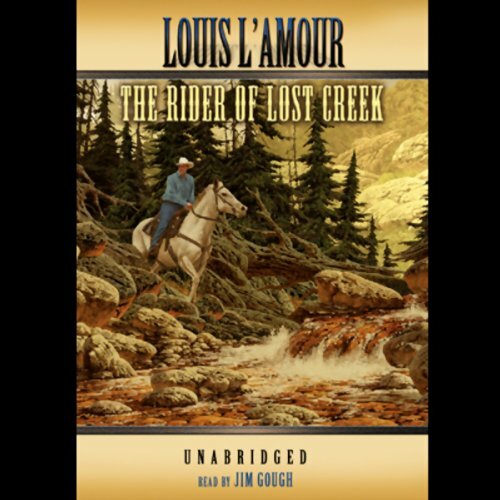 I love Louis L'Amour stories, but Rider of Lost Creek is not his best book. This was a good book. Can't of put me in mind of a Saturday matinee. It was great fun!